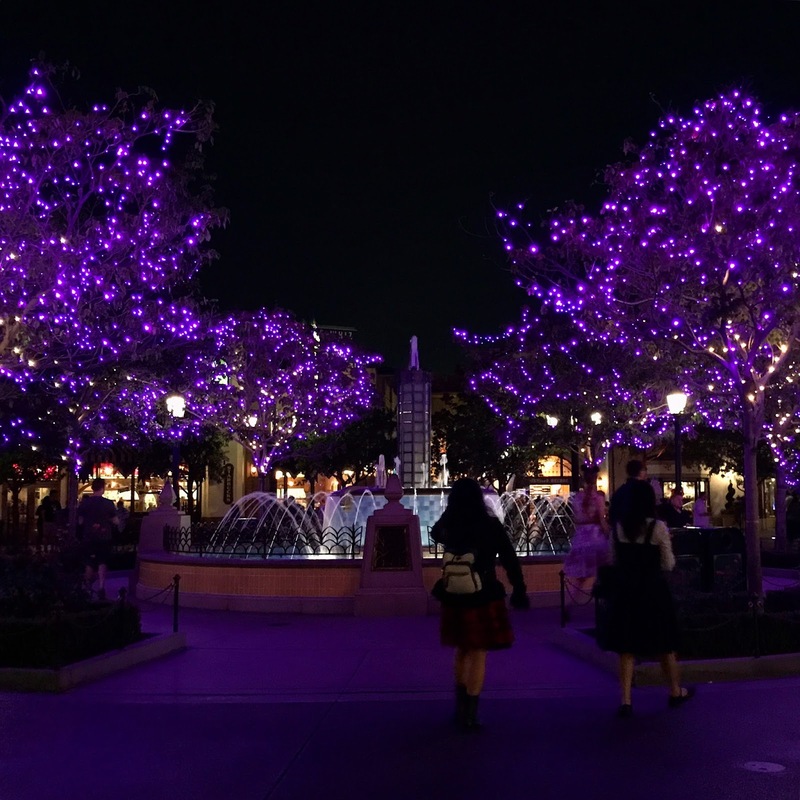 With September comes Disneyland's Halloween Time. 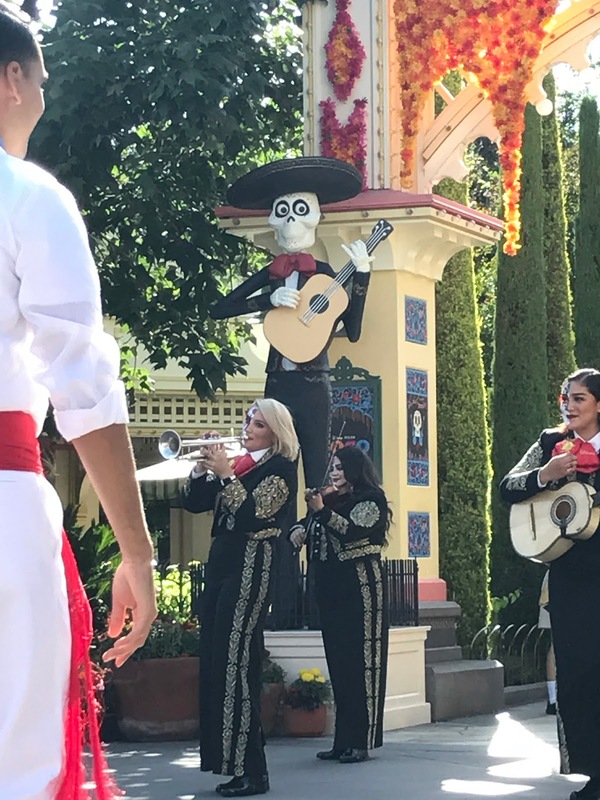 We've already posted a list of what you can expect to see this year, but we wanted to show you as well! 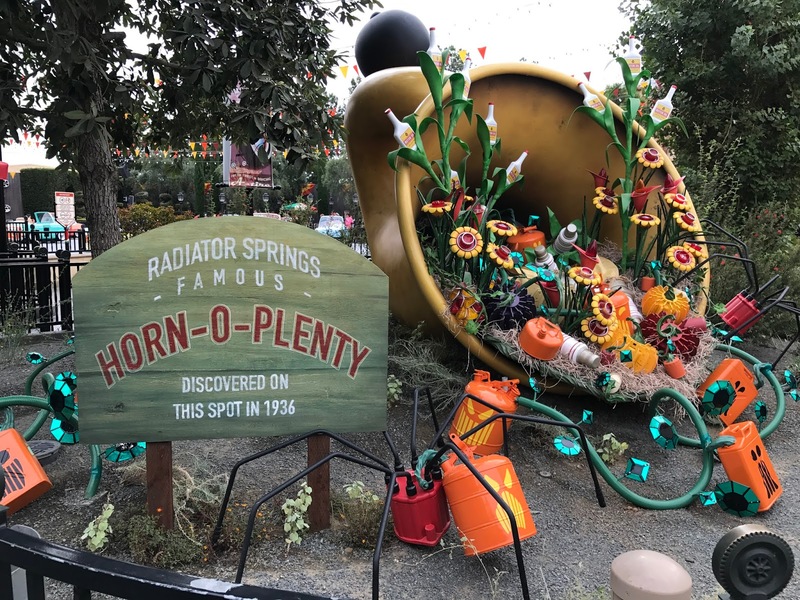 The original park has the awesome Halloween decorations that we've all come to love year after year! 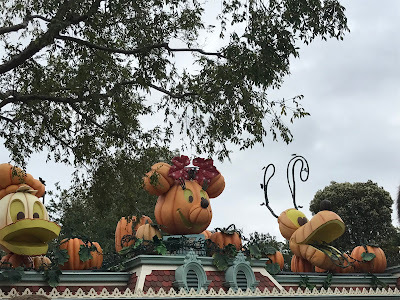 Jack O Lantern Characters greet you while you're waiting to enter the park. The Main Street Station is full of fall colors ands the Halloween Time logo. The lines to get a pic with the giant Mickey pumpkin are pretty long, but so worth it. Look at his smile! 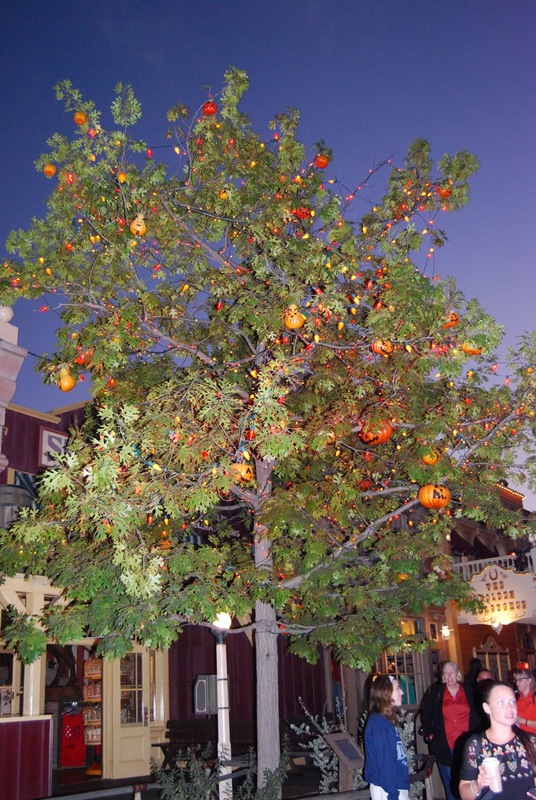 The Main Street Pumpkin Festival is in full swing. 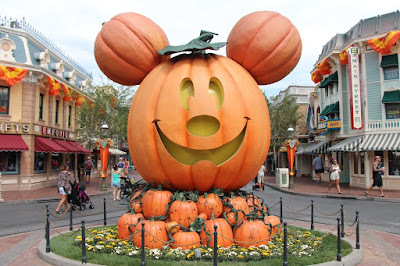 My favorite is always the Elvis pumpkin in front of the music store! 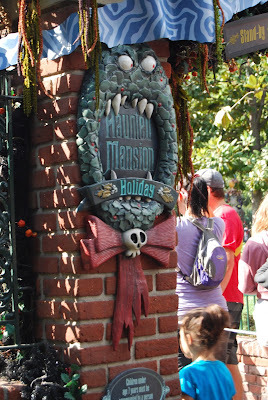 The Haunted Mansion Holiday will be here through early January. Don't forget those Fastpasses! 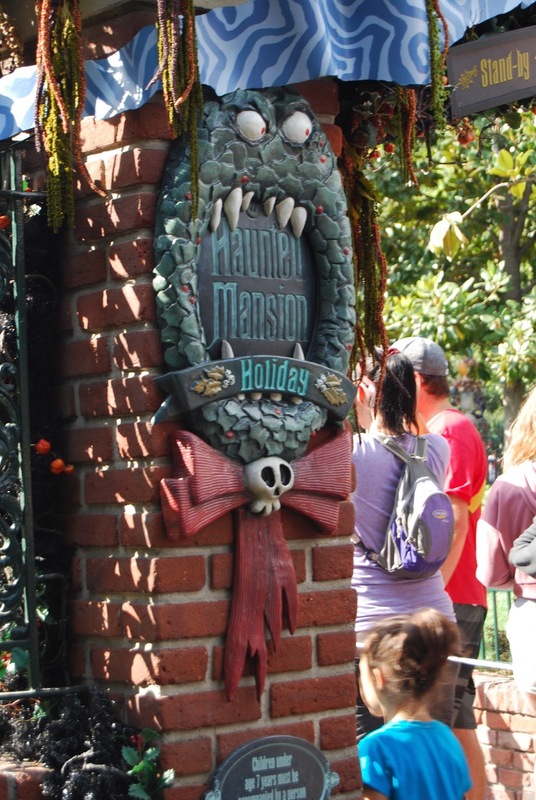 It might say "Xmas," but its perfect for Halloween! Don't forget to check out The Halloween Tree in Frontierland. 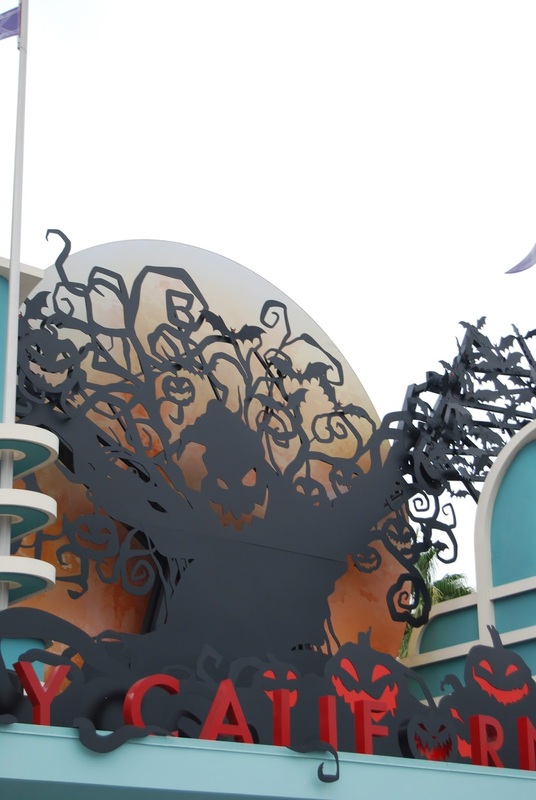 The Halloween Tree is full of spooky fun! Ok, the Matterhorn doesn't change for Halloween, but don't the seasonal balloons make it more festive?? 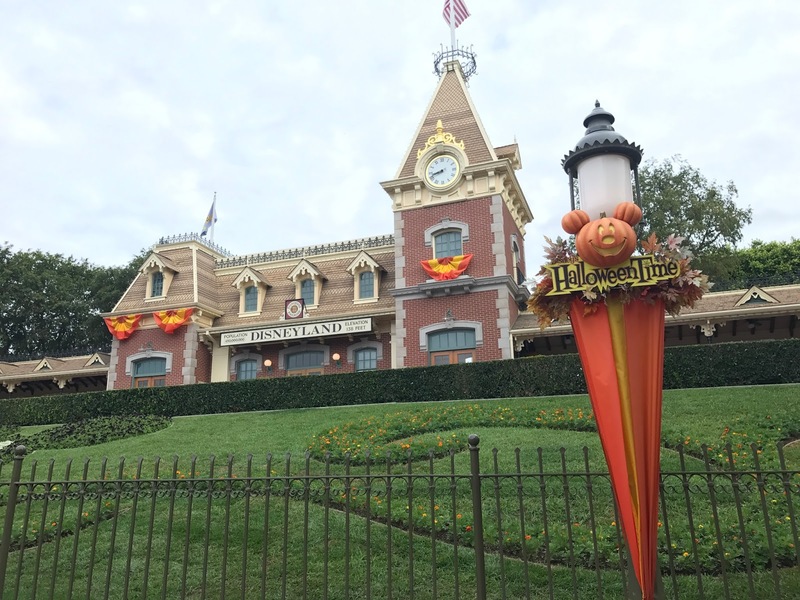 This is the first year of Halloween decorations at DCA, and they went all out! Oogie Boogie greets you above the DCA entrance on your way in. 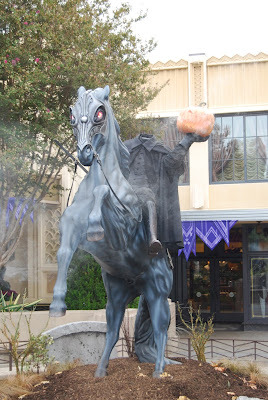 Day or night, Oogie is ready for some Halloween fun! The Headless Horseman is ready to ride through Buena Vista Street! 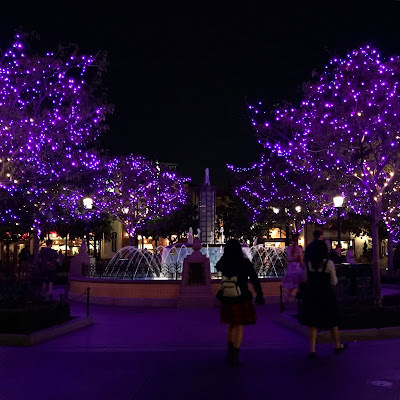 Purple lights are in all the trees. Watch a live show describing the new Pixar movie Coco, and check out some great Dia de los Muertos decorations. Cars Land is where most of the Halloween Action is! 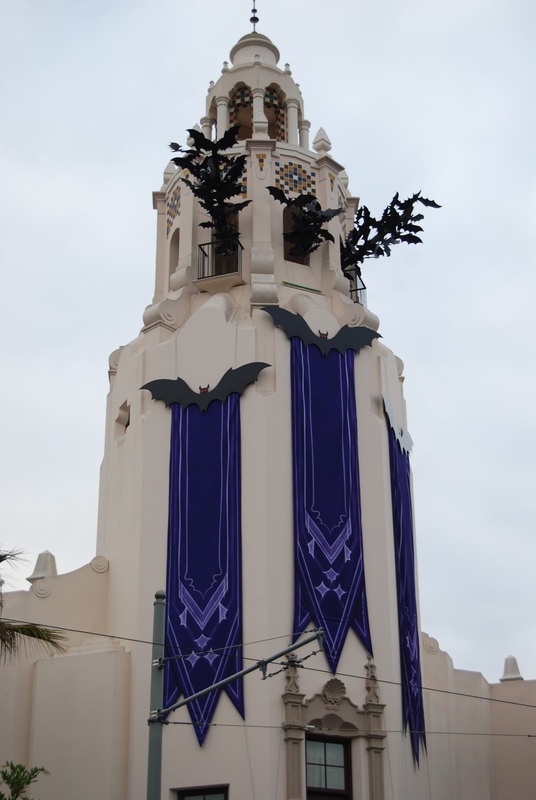 Spooky faces hang above the street. 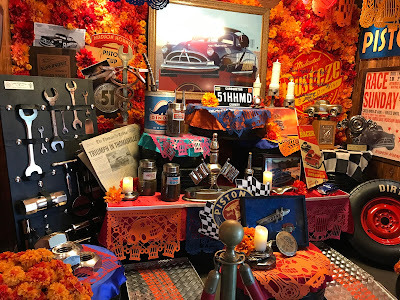 Sit in the spider car at Flo's! Luigi's has some new songs that are Halloween themed. 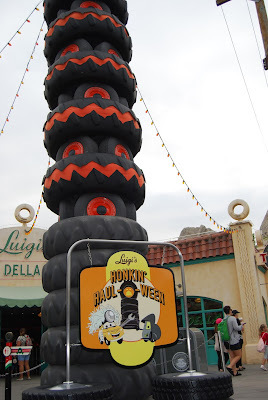 Plus some tire pumpkins while you wait! Car themed Halloween movie posters...Hocus Spokus!!! Mater's pet tractor is a mummy, and the Junkyard Jamboree is now the Graveyard Jam-boo-ree. 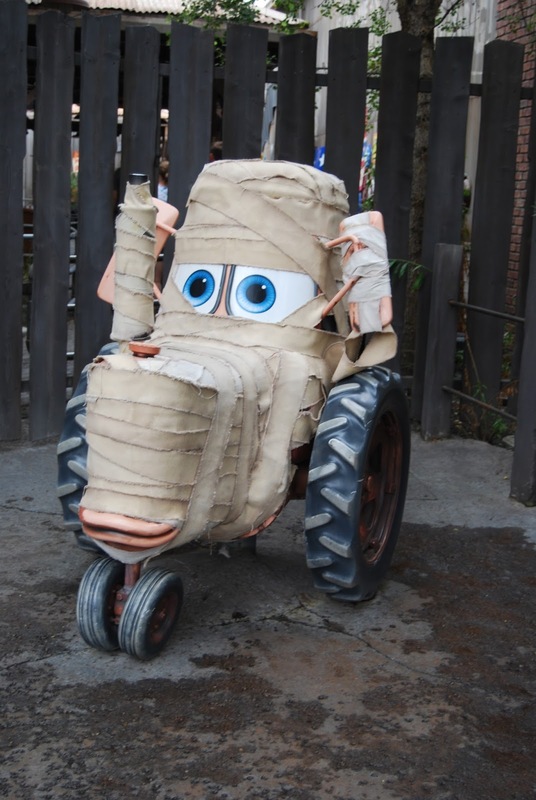 Lightning, Mater, and Red are all out in their Halloween costumes. 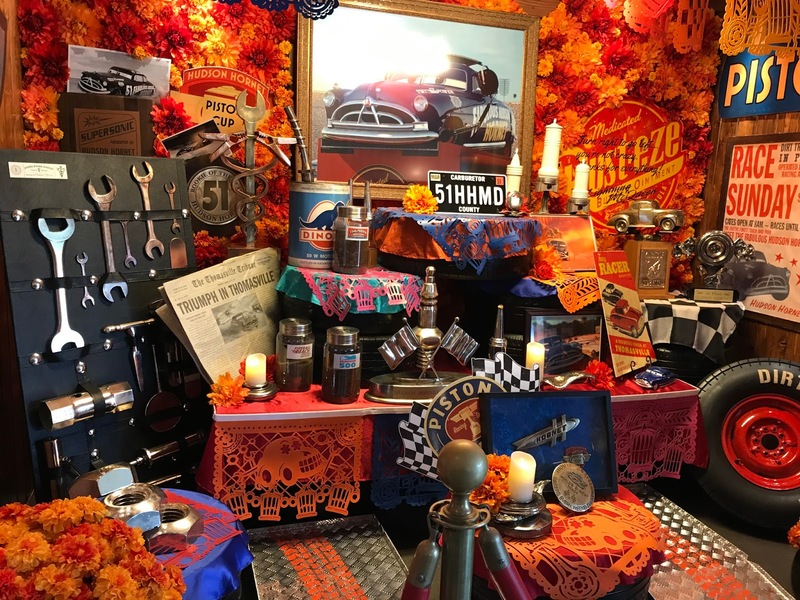 Inside Ramone's you can find a Dia de los Muertos altar for Doc.